The country was calm yesterday, encouraging a number of companies to open for business after three days of opposition-led anarchy in Bulawayo, Harare, Gweru, Gokwe, Kadoma and a few other places. We saw the worst of the barbarism on Monday and Tuesday when a call by the MDC Alliance, Zimbabwe Congress of Trade Unions (ZCTU) and like-minded organisations to "shut down" the country resulted in their supporters and common criminals unlawfully entering supermarkets, butcheries, bars and other businesses to loot anything they saw and could carry. In Bulawayo, Choppies supermarkets in New Lobengula and Entumbane were burnt in the chaos while the chain's branches in Pumula and Lobengula West were looted. There were also reports of looting from shops in Nkulumane, Lobengula, Pumula, Emganwini, Luveve, Magwegwe, Sizinda and other areas. Many schools were closed, public infrastructure was destroyed, thousands of people were injured with some losing their lives in the mayhem. Fortunately, the security forces got on top of the situation on Wednesday. They contained the looting, forcing the terrorists to retreat into their hiding places. Nonetheless, some 600 of them had been arrested by Wednesday and 214 had appeared in court. Yesterday, order had been totally restored across the country and some businesses reopened though they were restricting entry into their premises and limiting the amount of items one could buy to prevent stampedes, looting and hoarding. We expect many more businesses to follow suit today. As this happens the victims of the so-called shutdown begin, in earnest, to count the cost of the senseless violence. The Confederation of Zimbabwe Industry (CZI) has said the economy may have lost $300 million. "We record about $100 million per day and given that some companies operated on skeletal staff in the last three days, the loss could be between $70 million and $100 million per day," CZI president Mr Sifelani Jabangwe said. "The strike has significantly affected our members in terms of production and sales. We are also concerned about the loss of life that we hear which is unfortunate. These are the economically active that we lost. "We think in as much as it is their right to protest as indicated in the national constitution, the protesters should also not infringe on other people's rights because right now, we have cases of property destroyed and what is worse is that insurance companies don't cover damages arising from riots. . . . Solutions to the economic challenges will not be easy and we believe that the general conduct of demonstrators may cost the nation in a big way. You see, the investors we want will not come because they will say 'Zimbabwe is not a safe investor destination'. The economic challenges will not be solved by burning down property. It is easy to blame Government for the economic challenges but we are also to blame as citizens due to our actions." The million dollar question is who is going to pay the bill to reconstruct businesses and infrastructure that were destroyed as a result of the criminality? The Government and Zanu-PF, the supposed targets of the violence, will obviously not pick up the tab. The bill will be actually borne by the people of Zimbabwe through the rates they pay to councils and business owners. In our view, this highlights the futility of the kind of violent protests we witnessed this week. The sum that the CZI gives, $300 million is a huge sum of money for our struggling economy; it is a loss the economy should not have borne and will take many months for the economy to recover from. 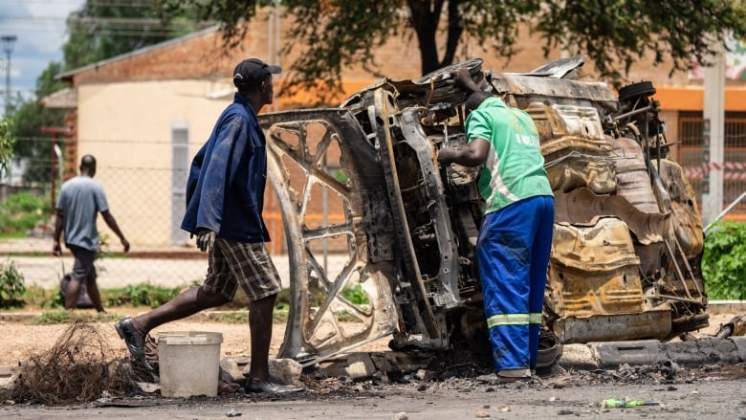 It is worse for those who suffered damage to their businesses and business premises since, as Mr Jabangwe said, insurance companies don't pay for damage that occurs during riots. As a matter of fact, the CZI bill is an understatement as it covers members of the organisation, who are manufacturers. It excludes members of the Zimbabwe National Chamber of Commerce for instance, as well as small and medium enterprises. The cost of the violence is thus far higher than Mr Jabangwe's estimate. The Government has said the people could sue MDC Alliance and its allies who organised the illegal demonstrations that ended in the looting, arson and beatings. That is a great suggestion and victims of the violence might see value in pursuing it at the courts. However, court processes typically take long to conclude yet the damaged business premises need to be repaired for business to resume and infrastructure must be rebuilt, most urgently. This means that business owners will have to look for money from their savings, or possibly take loans to start all over again. This is for the fortunate ones; fortunate only because we don't have a better word to describe their predicament. For many others, the violence might have buried their businesses for ever. Many businesses in the country are just surviving because of the prevailing difficult economic environment. Some only "needed" the misfortune that visited them on Monday and Tuesday this week to collapse. We commiserate with them, unhappy also because it took reckless third parties to precipitate their demise. On another note, hundreds, if not thousands of jobs may have been lost as well. Companies only pay their employees for work done and if there is no work they can't pay anyone. As such some among us had jobs on Sunday, but they had been rendered jobless the next day following the rioting instigated, most ironically, by the ZCTU, an organisation that under normal circumstances, must be fighting to preserve and grow jobs.